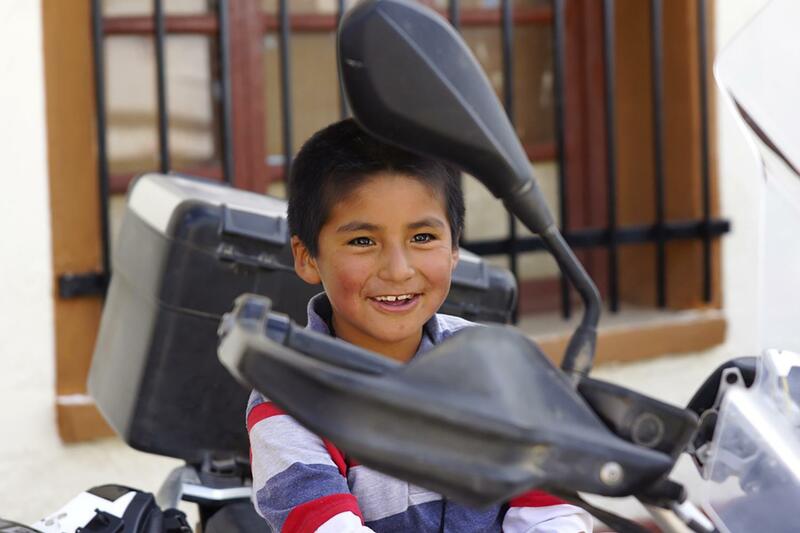 This ride, starting in the mountains that are the source of the Amazon, takes in the wonderful desert landscapes of Colca Canyon and the Atacama Desert, visiting adobe villages such as the oasis town of San Pedro de Atacama. 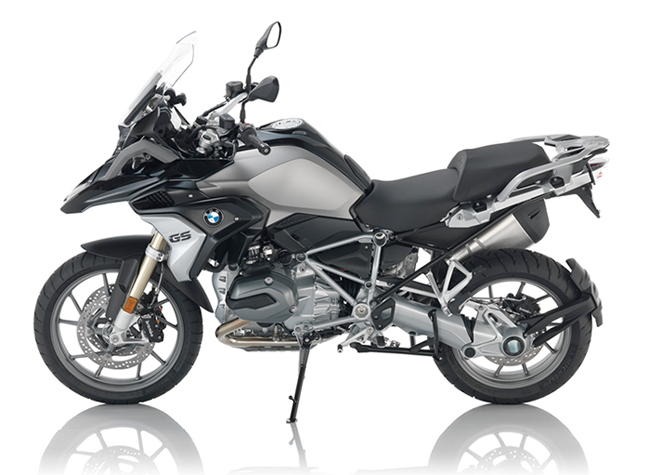 The ride shall visit Bolivia the highest and most isolated country in Latin America. 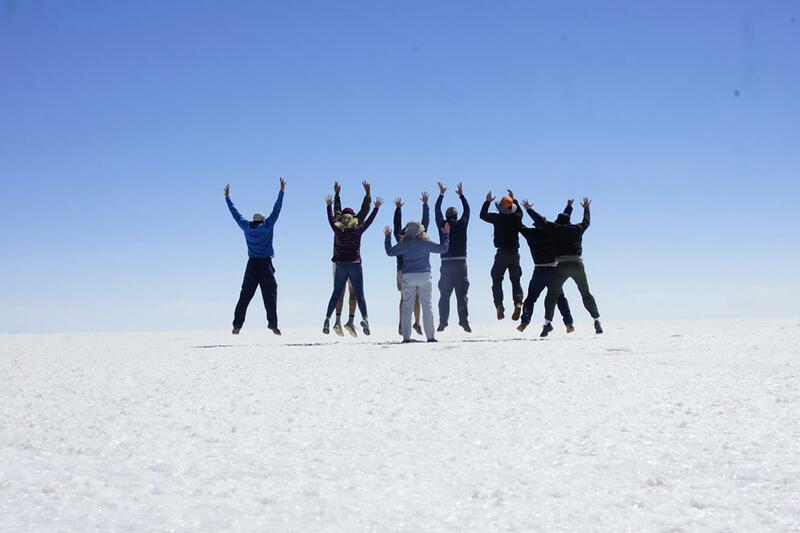 Bolivia is a kaleidoscope of landscapes and experiences as we visit the absolutely stunning Salar de Uyuni, the world’s largest salt flats along with the epic vistas as we cross the Andes. We visit the world’s highest city of Potosi before descending!! to La Paz, Bolivia’s unofficial capital. 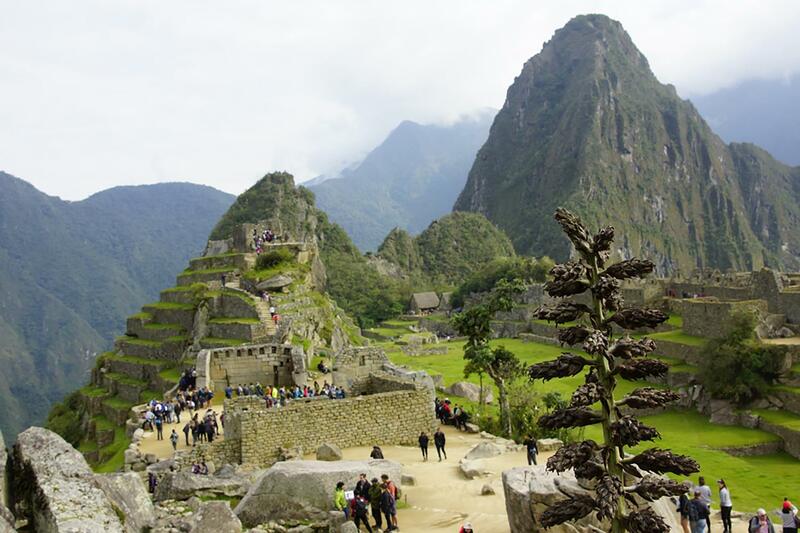 We then cross into Peru a land of world-renowned antiquities and awesome landscapes. We shall visit the world’s highest navigable lake, Titicaca, before arriving at the Incan heartland of Cusco, a fabled city built upon Incan ruins and the stepping off point for the stunning sacred valley and the 7th wonder of the world Machu Picchu amongst other Incan ruins. 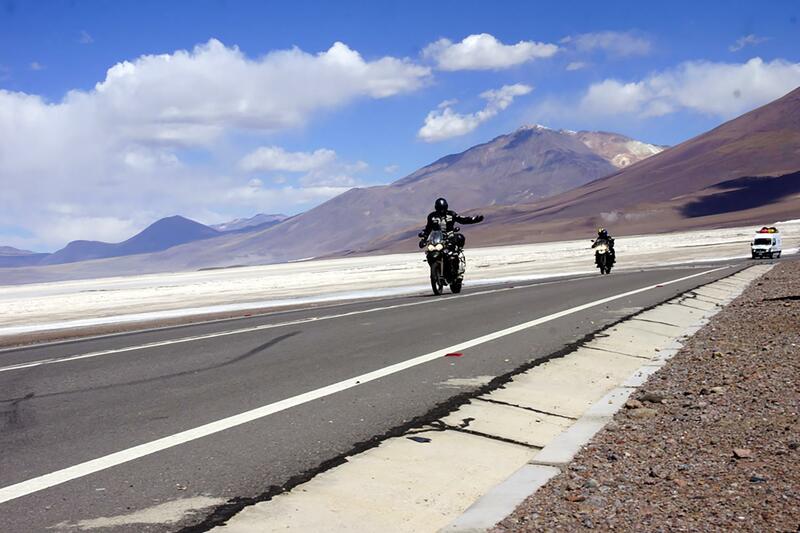 Join us for this experience packed 19-day motorbike adventure across the rooftop of South America. Joining Day: Your Arequipa airport transfer will take you directly to our joining hotel, ready for an early start tomorrow. Today you will meet your crew for your tour briefing and welcome dinner. Day 1: We ride toward the world’s deepest canyon of Colca Canyon staying at Chivay, home of the giant Condors. The ride is magnificent as we get off the Gringo Trail, riding amongst volcanoes and mountains in this spectacular desert landscape. It is in these very mountains that the mighty Amazon River begins its journey. The hot springs of Chivay are a perfect way to relax and unwind after a hard days ride. Day 2: An early start to ride 35 km / 22 miles of gravel road to the lookout ‘Cruz del Condor’ where we can get up close and personal with the amazing condors. Returning to Arequipa we will have some time to explore what is considered to be the finest “Plaza de Armas” in all of South America. Day 3: Departing Arequipa we ride south along the spine of the Andes as the road winds its way through seemingly endless valleys and small Peruvian villages to the southern Peruvian city of Tacna, formerly part of Chile. Day 4: We cross into Chile today and into a stark yet beautiful Atacama Desert landscape. We eventually descend from the desert into Iquique spectacularly set on the shores of the Pacific Ocean. Iquique is known for its superb beaches, casino and laid-back lifestyle. 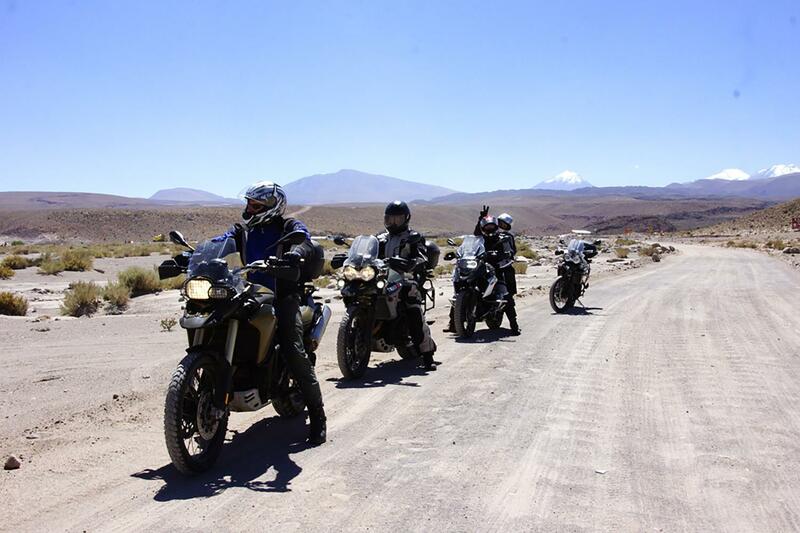 Day 5 & 6: A fantastic ride day as we travel into the Atacama Desert, known as the driest desert in the world. San Pedro de Atacama is recognised as the archaeological capital of Chile as it has many beautiful natural and cultural attractions. We spend two nights here in this wonderful adobe village where it hasn’t rained for over 400 years. We visit the Valle de la Luna for a spectacular sunset over the Atacama. Day 7: Today we leave San Pedro on well-paved roads through the desert to the town of Calama. From Calama we remain on paved roads then onto good gravel roads towards the high mountain town of Ollague, passing the stunning Volcano Ollague along the way. We will overnight here in basic accommodation in this remote, unique town. 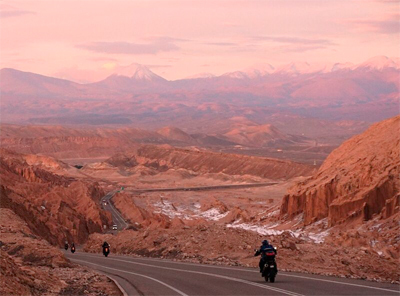 Today's ride offers us spectacular views of the Atacama Desert, a dramatic landscape that incorporates desert, salt flats, volcanoes, geysers and hot springs with an enjoyable mix of paved and dirt roads. 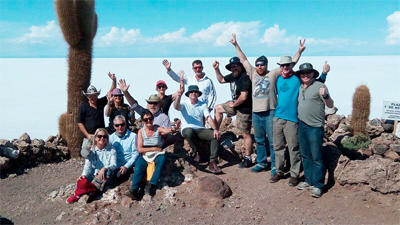 Day 8 & 9: Today’s ride will see us cross a remote border into Bolivia and descend across the open, rugged landscape until we reach the edge of the Salar de Uyuni. Most of the ride today is on dirt, is remote and is absolutely stunning, this is a ride you won’t forget. Upon arriving into Uyuni an enjoyable evening will be spent at the Tonito Hotel, which has the best pizza restaurant in Bolivia and possibly the most amazing star-laden sky on earth. Two nights are spent here allowing us to visit what must be some of the most remarkable scenery on earth, the 11,000 sq km / 4000 sq mi landscape of bright-white salt, rock formations and cacti-studded islands of the Salar de Uyuni. The drive across here can be hallucinogenic; being out on the vast expanse of the Salar, everything is a reflection of everything else, its impossible to define where the horizon is. We take a 4x4 across the Salar to Fish Island where we view the giant cacti and enjoy a picnic lunch. We eventually return to Uyuni at sunset to visit the train cemetery. A wonderful collection of old steam trains simply driven into the desert and left to rust. It is said that one of the abandoned locomotives was the last train that Butch Cassidy and the Sundance Kid robbed, just that no one knows which one! Day 10 & 11: The scenery today is similar to that of the Wild West with canyon lands, rocky outcrops and the ever-present mountains all around, it’s absolutely wonderful. An occasional oasis dots the landscape and brings with it poplar and willow trees. Today we will be visiting a small Bolivian school that we have sponsored for over 10 years now, so if you would like to donate some gifts it would be much appreciated. Fresh fruit and veggies, sporting supplies (basket, volley and soccer balls are great gifts along with general schooling supplies). The school is located in Chaquilla some 50 km / 31 mi from Potosi. The best place to purchase any donations will be in Uyuni. The following day is yours to relax and wander this fascinating UNESCO listed city, which was once one of the largest and wealthiest cities in the world due to the abundance of silver, and still is the highest city on earth. It was Potosi that bankrolled the Spanish Conquistadors as they plundered the South American continent. Visit La Casa del la Moneda (the mint) museum or the Cathedral in the Plaza de Armas. However, the highlight of today is a visit to a working mine at Cerro Rico, a tour you will never forget (optional). You get the chance to witness the incredibly harsh conditions the miners still work under and learn some of the 500 years of mining history, where else can you offer dynamite and 95% proof alcohol to miners as gifts? Day 12 & 13: Riding west from Potosi through the mountains of the Cordilleras de Azanaques and de Los Frailes, the roads reach heights of 5,200 metres / 17,160 feet. There is not a lot of traffic on this road and we pass through a few small villages that remind us that people actually live out here. 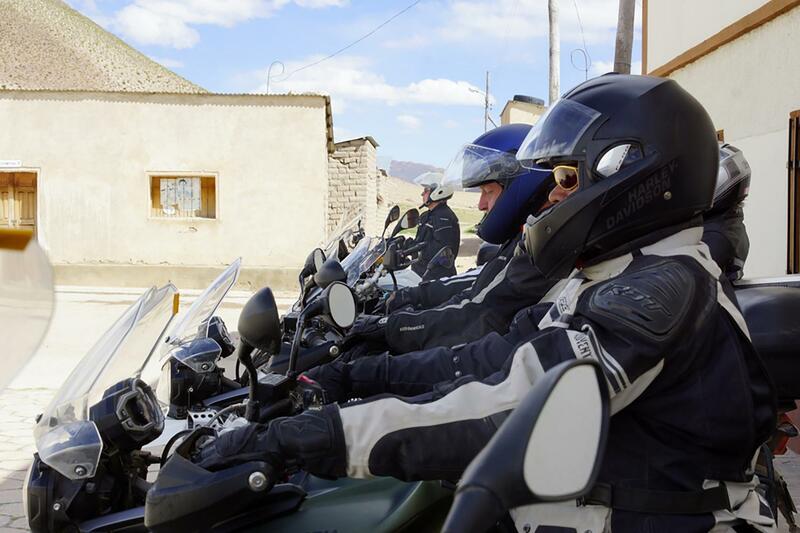 After this high altitude ride, we reach El Alto where we leave our bikes and take a transfer down into La Paz, you will soon see why we don’t ride into La Paz. A full day in La Paz allows us time to explore the city including a city tour visiting the witches market, government house, Plaza Murillo residential area and Valle de la Luna (Moon Valley). La Paz has one of the most dramatic settings of any city in the world, made all that more imposing with the towering snow-capped Mt. Illimani looming above. 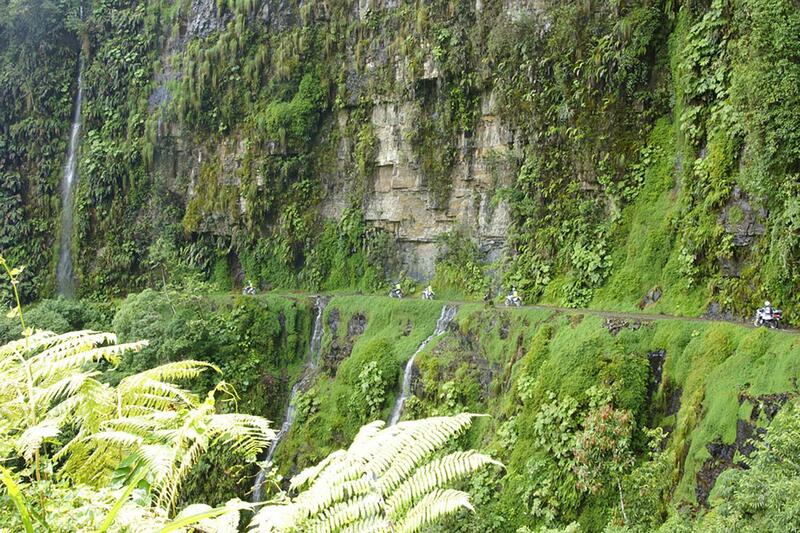 For the more adventurous, or slightly mad, riders can experience the Death Road motorcycle trip (optional). This is an amazing ride down what is regarded as the world’s most dangerous road a short distance out of La Paz. 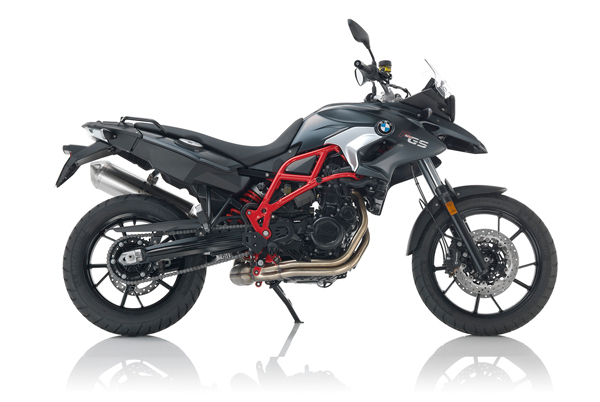 Please note this is on rented bikes, not Compass bikes. Day 14 & 15: An early morning transfer will have us reunited with our bikes before riding out toward the Bolivia/Peru border. We take a rickety ferry across an inlet of Lake Titicaca where it is advisable for riders to literally hang onto their bikes to save them going overboard. Riding along the shores of Lake Titicaca we shall have great views of the snow-capped Andes far off in the distance. We arrive at the Peruvian city of Puno spectacularly set on the shores of Lake Titicaca. 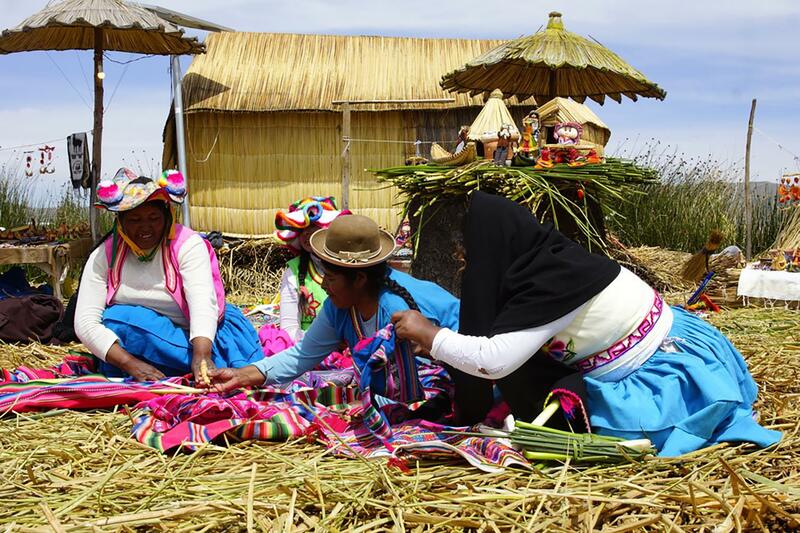 The following day we take a boat excursion to the amazing “Uros”, the floating reed islands of Lake Titicaca. The floating reed islands have to be seen to be believed, they actually float and support entire communities, one island even has a school, just don’t stand in the one spot for too long as you will eventually begin to sink!! The views across the lake are astounding, ringed by snow-capped peaks and Bolivia in the distance. You will return to the hotel by lunchtime and you have an afternoon to explore Puno or relax in the hotel. 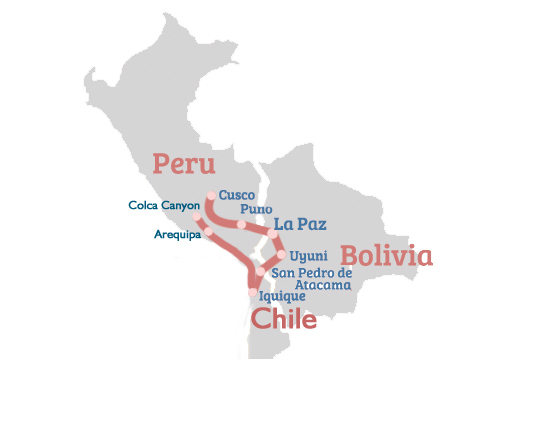 Day 16 & 17: Traveling northwest the ride will take us through the town of Juliaca and high into the Andes crossing the 4,319 m / 14,252 ft pass at La Raya, before reaching the wonderful city and Incan capital, Cusco. Today’s ride is spectacular with the towering snow-capped peaks of the Andes all around dotted with centuries-old Andean villages. We arrive at what the Incans call the “Naval of the universe” Cusco. We spend a full day in Cusco to explore this amazing city built on the still visible ruins of Incan fortresses. 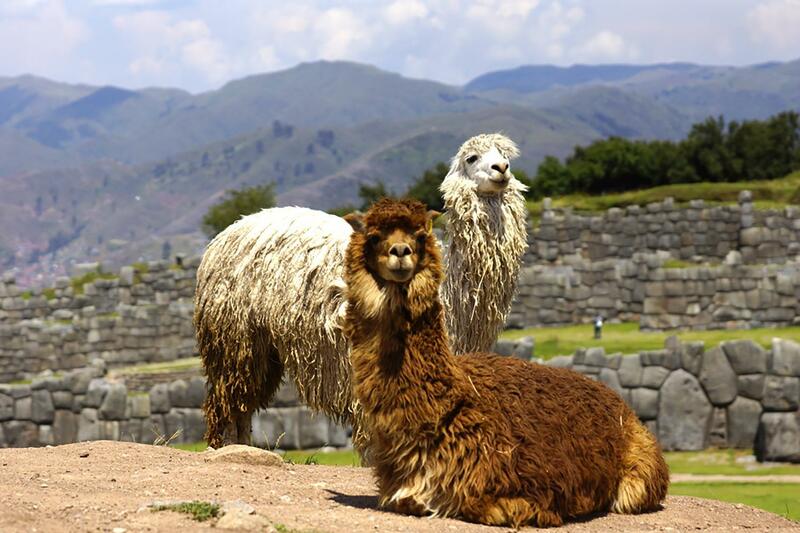 Cusco is a fantastic mix of Incan and Spanish cultures and is South America’s oldest continually inhabited city. 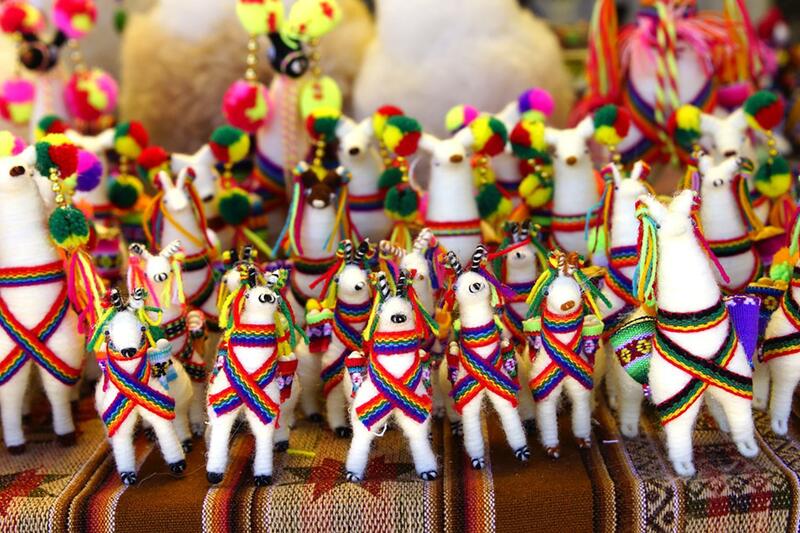 Cusco is home to narrow cobblestoned streets, ornate cathedrals, and colourfully dressed indigenous Quechan peoples walking their llamas to market past high-end restaurants or McDonalds!! Our hotel is located close to the impressive Plaza de Armas (main plaza) where we can enjoy a drink or meal at the legendary biker’s bar, Norton’s Rats overlooking the Plaza. Day 18: Leaving Cusco we ride the world-renowned Sacred Valley, dissected by the silt-laden Urubamba River and dotted with enormous Incan ruins dating back millennia before parking the bikes in Ollantaytambo in the shadows of an enormous Incan fortress. It’s the end of the road, literally, forcing us to catch a train to Aguas Calientes, which is the base for the legendary Machu Picchu. There is time in the late afternoon to visit the local hot springs before dinner. We overnight in the town of Aguas Calientes. Day 19: Today we catch the early bus for a 20-minute ride to the global icon that is the Incan fortress of Machu Picchu. We have a guided tour of this world heritage site to explain the significance of this breathtaking place. After taking time to explore and soak in Machu Picchu we return to Aguas Calientes and have some lunch before taking an afternoon train to Ollantaytambo, where we collect the bikes and take a wonderful “shortcut” via a high plateau that offers superb views of the ever-present snow-capped peaks of the Andes, to Cusco where we shall have our final dinner and reminisce on what has been an amazing South American ride experience. Departure day: Spend some time in Cusco or fly home, the choice is yours. 90% of this ride is on pavement, some sections of pavement can be potholed and narrow. There will be amazing mountainous rides. 10% of this ride is on dirt. There are days that are spent on hard packed dirt, sections of which have loose gravel and can be rutted. Some sections of sand may also be encountered. It is important to note that this environment is ever changing and as such so are the ride conditions. On this ride we will cross a 5,000 m / 16,400 ft pass and some time will be spent at an altitude over 3,000 m / 9,800 ft. 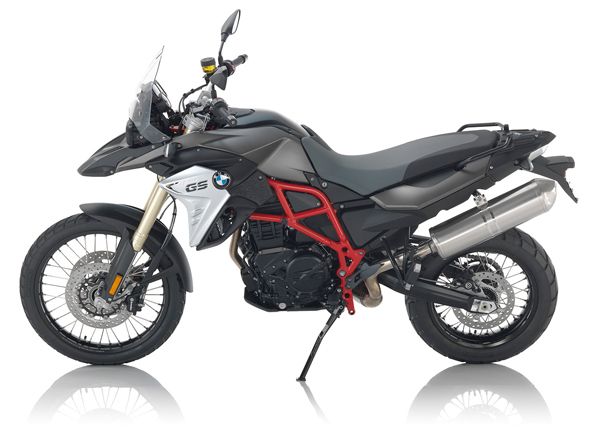 This ride is generally suitable for off-road novice and two-up riding excepting 2 days on the Bolivian Altiplano where some more difficult riding conditions may be encountered. At lower altitudes the weather is likely to be sunny and mild. In Bolivia and Peru we ride the Altiplano (high plains) and the Andes Mountains where we will experience cool weather, with mostly clear sunny days. It’s not the rainy season so we should not expect rain, however it is the mountains so keep in mind that rain is always possible and there can be very cool temperatures. Our accommodations range from small family run hotels through to 4 star hotels. It has been a great trip Mick. Daniel, Pieter and JC have been fantastic. Another great Compass trip nearing the end but great memories. Hi Craig, the tour was fantastic which hold special memories for me to share for years to come. A special thank you to Dennis and Hugo for making things run smoothly, even when at times it must have been frustrating especially at the border crossings! Also a thank you to Sayda and for all those who worked ‘behind the scenes’ to make it a special trip for us. Jerry. I had a fantastic time on the tour and I can't say enough about Hans and Thomas as a team. I've done some guiding and rescue work myself in the paddling and climbing fields and I was really impressed with their ability to manage safety, schedule and personalities without seeming to be managing. That's really a trick as I am sure you know. We had an absolute cracker of a trip and really appreciated the effort your team over there put in. The whole operation worked really well and the tour was everything promised and more. Back in Oz now from the South American trip. It was a great trip with good people and a very professional and competent crew. The trip was everything I had hoped for and more. The people on it were a great group, which made the trip so munch fun. The trip would not have been so successful without the team of people you assembled. All three guys were in their own way amazing, helpful and knowledgeable. Danny is a great leader with the perfect personality for handling a diverse group of people all with different skill sets. He had many helpful riding tips and discussions about the terrain and what to expect for the day. Great team talks! Motorcycle repairs where kept up and everything was fixed by the next morning. Paperwork and border crossings were handled perfectly in an imperfect environment. Thanks again for a great trip and I look forward to doing another one with your company. Awesome! Loved every minute! This is our third organised tour - our experience with the other tour companies was very good but Compass is even better especially for pre tour communication and organisation.